← Stan Bober reports for Florida’s West Coast District!! Some “Interesting Reading” about our Sport. Check It Out!!! Granted, the last time I played shuffleboard was with my parents — who are in their 60s — in a Florida community where many people are retired. “Plus where would we even go?” he followed up. This isn’t the first time I’ve heard this, but shuffleboard isn’t just found in Florida retirement communities. 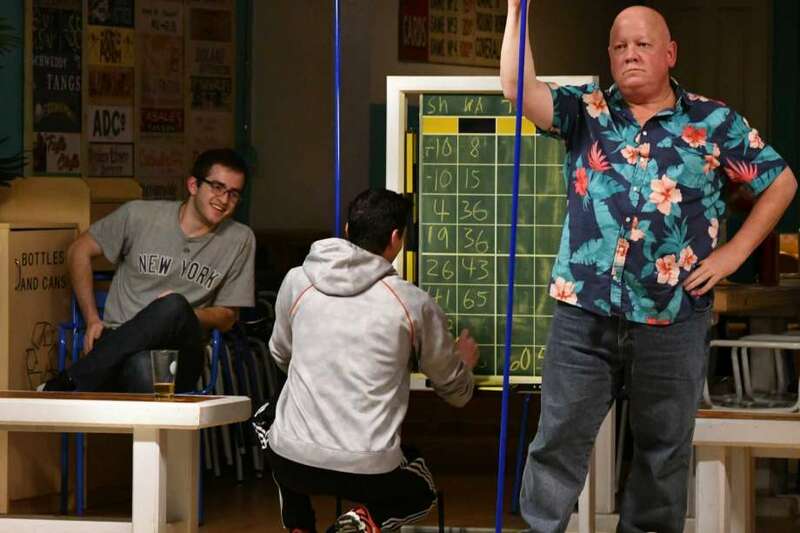 In fact, the pastime has made its way into the Capital Region at Franklin Alley Social Club, one of just a couple dozen shuffleboard clubs in the country. And despite what people may think, the sport isn’t played solely by septuagenarians. Many people in their 20s and 30s are starting to embrace it on their night out — holding a shuffleboard stick in one hand, sipping a pina colada or craft beer from the other. The entrance to the club, which opened in December 2017, can only be found while wandering down the dimly lit alley off of State Street, also known as Franklin Alley. In the street is a short bamboo fence, in front of it is a sign, “Find your beach” with a chalk arrow pointing at an aquamarine door – a portal to a sliver of paradise right in downtown. A staircase, lined with sunshine yellow walls, leads to the basement of the 50 Franklin St. building. Ferns hang off of the building’s old pipes, fake parrots are perched on top. At the bottom of the staircase the whack of disks hitting each other, the clink of glasses, which are topped off with rum or tequila and classic rock can be heard. “Welcome to Franklin Alley Social Club,” says a tall slender man with a relaxed smile, 5 o’clock shadow, shaggy hair and, you guessed it, wearing a Hawaiian shirt. Meet Frank Sicari. He owns the club along with his wife Heidi Sicari. The two are not retirees, they do not have white hair or even any wrinkles — they’re both in their mid 30s. They met eight years ago in Albany and four years later they bought this building. The couple, who also own Takk House, a wedding and event venue in the same building, decided to do something they with the basement of the building, which had for decades been a bowling alley, a couple years ago. They began to brainstorm. Should they renovate it and keep it as a bowling alley? Too much money. Keep it as storage? It’s too cool to leave untouched. That’s when they threw out the idea of shuffleboard. The two had played shuffleboard on their honeymoon in Bermuda — and to their delight not only was it fun, but there were people of all ages playing. This sealed the deal — they were going open their own shuffleboard club. The bowling lanes were turned into two shuffleboard courts and a bocce ball court, the walls were painted Caribbean current blue and yellow lights were strung about. Where the bowling pins had once stood was turned into a VIP section, complete with porch furniture and ferns — a spot that groups take over for their birthday, while drinking out of a giant pineapple with friends. The basement had been transformed into what resembled the roof deck of some deluxe retirement home that would be found in St. Petersburg, Fla. But instead of the space filled with retirees, with walkers leaning up against a wall and bingo numbers being called over the loudspeaker, it is filled with people mostly ranging from their 20s to 40s. A group of girls, in their early 20s, walk along the courts as they play, their heels clacking. They are wearing skirts or dresses, their hair is perfectly styled and makeup vibrant. Their outfits hint that this may just be the first stop in a night of gallivanting from bar to bar downtown. On the court next to them are two couples that look to be their 30s. The separate couples talked to one another, giggling, as they shared their drinks. One of the guys begins giving the woman next to him tips — the perfect icebreaker. “It’s a space for anyone and everyone,” Sicari said. From coworkers looking to replace work talk with casual conversation, blind dates looking to do something besides a simple drink or parents looking for an exciting night out on the town. The group, who were wearing T-shirts and jeans, yelled across the court at each other, egging each other on, while taking bites of their food in between turns. To add to the fun, the Sicari’s installed classic arcade games, counters and tables were installed for people to sit and eat at and yes there was a bar where mojitos, beer and spiked punch are being doled out. After 8 p.m. the club is 21 plus only. Along with the classic tropical drinks the social club has added some of their own. From ‘Mezcally Me Banana’ (Mezcal with grapefruit, lime, banana liqueur and simple syrup), flights of tequila to even large cocktails to share with your friends like the ‘Deep Blue Sea’ (rum, vodka, lemonade, blue curacao, peach, lemon and Swedish fish). People surround the courts, holding their vibrantly colored drinks watching the games as they wait their turn to play. Eight discs (the proper term is biscuits) slide across the floor before coming to a halt. Don’t know how to play shuffleboard? No problem. When you buy time on a court ($5 per person for a half hour or $10 per person for an hour) you are also taught the rules, which are easy to follow … even after a drink or two. “You basically learn the rules in five minutes and after that you’re pretty much as good as anybody else playing,” Frank Sciari, the owner of Franklin Alley Social Club, said. The rules are simple. Two teams stand on either side of the court. Each team takes turn pushing four discs (biscuits) using long aluminum poles (tangs) to a triangular zone. Different areas earn you a different number of points, which are displayed on the court. You can knock your opponents biscuits out of zones by hitting them. The teams to reach a certain score first wins. At Franklin Alley, unless it is a league night, they play eight frames in a game. Whoever has the most points at the end of that wins. Garrett Kipp and Josh Whelan, who look to be in their late 20s early 30s, put their beers down on the table behind them before leaning to the ground to observe where their partners’ biscuits landed. “That’s touching the line,” Kipp said. They argue back and forth for a second, laughing, before picking up their beers, taking a gulp and shooting there shots. “The beautiful thing about the sport is that you don’t have to be athletic to play,” Heidi said. It’s true, in order to play you don’t need a ton of strength or even use a ton of brain power–which is helpful, especially for those who drink a couple mojitos before their turn on the court. Besides being easy to play, Heidi said, it’s still unique here. A quick Googlemaps search reveals that the closest floor shuffleboard club to the Capital Region is the Royal Palms in Brooklyn — which has been boasted by various publications as a hot spot among barhopping hipsters. In fact, Frank said, there are less than a dozen shuffleboard clubs in the U.S. — which includes ones in Illinois, Florida and Ohio. The Sicaris are not the only ones who have fallen for the sport. They said ever since opening they have been busy, so busy that on some nights that they are completely booked. They already have more than 70 members in the social club, although you don’t need a member to play. They have a weekly league, which began with six teams, expanded to 12 the second season and is expect to continue to grow.